Distinguished by its coat of small, tight, water-resistant, crisp curls, the Curly-Coated Retriever is a strong, robust and agile breed. Developed to be a multi-purpose hunting retriever, the Curly will work for as long as there is work to be done, retrieving game in the heaviest of cover and iciest of waters. The breed?۪s curly coat can be black or liver in color. Although the Curly?۪s origins are unclear, he is one of the oldest of all retriever breeds, thought to have descended from the English Water Spaniel, the St. John?۪s Newfoundland, the retrieving setter and the Poodle. Developed in England as both a waterfowl retriever and upland game hunter, this breed was a favorite of English gamekeepers for his innate field ability, courage and perseverance. An energetic and intelligent dog, the Curly-Coated Retriever is an excellent companion, but requires training and daily exercise or a job to keep him from becoming bored and destructive. One of the more independent retriever breeds, the Curly may appear somewhat aloof, but is always willing to please. Their coat is easy to care for, requiring only occasional bathing. Sporting Group; AKC recognized in 1924. Ranging in size from 23 to 27 inches tall at the shoulder. 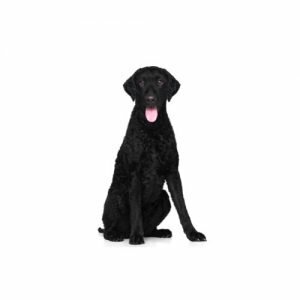 Are you interested in purchasing a Curly-Coated Retriever?